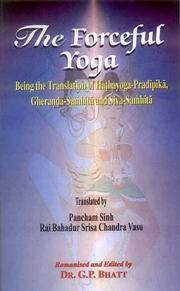 This book, which is the collection of the three principal sources on the Hathayoga, namely the Hathayoga Pradipika, the Gheranda Samhita and the Siva Samhita, written in the medieval period, is rather the reproduction of the three Sanskrit texts and their revised English translations, originally published by Panini office, Allahabad (1914-15). The Hathayoga or 'Forceful Yoga', which was particularly popularized by Gorakhanatha, a noted thirteenth century yogi, still has many followers in India and abroad. The most distinctive element of the Hathayoga is its theory, that the prescribed purifications of the body and physical exercises and practices related with the cakras, nadis, kundalini and so on, eventually, lead to the samadhi or supreme concentration of the mind. Further more the practitioner may develop supernormal powers to realize the summum bonum of life. This collection of the three texts makes a brilliant exposition of the above theory to compensate the loss of the Gorakhnatha's original text on the Hathayoga. Dr. G.P.Bhatt, M.A. Ph.D. has specialised in the epistemology of the school of the great mimamsaka kumarila Bhatt and is the author of The Basic Ways of Knowing, a revised edition of the Bhatta School of Purva Mimamsa on the subject. He is currently Academic Consultant to the Publishing House of Motilal Banarsidass.